Last time I bought L. I bought LL because it was too tight, but here it was very fluffy. It is just a bad idea to use gloves and gloves, but it is a little disappointing to grab things. This review is about item#6126671. I am using it for safety when treating weakly acidic liquids. I have used it for 20 years. However, we do not use it, we will exchange it for a new one by using several times. This review is about item#6126662. 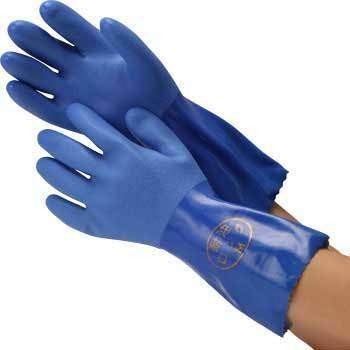 Because the material is transporting work of precision machinery and the product is plenty of oil to prevent rust, hands become dirty with ordinary glove hands, rubber gloves will melt if not oil resistant, so this glove Because it is oil resistant and long, it seems that per wrist will not get dirty. This review is about item#06126662. It covered up to the wrist and it got dirty It got better workability. It is more durable than the Monotaro brand and I am very satisfied. I asked the manufacturer about the resistance to thinner, but it was a reply that "can not be guaranteed", but I can handle it without any problem with thinner or alcohol. Degreasing work at the time of painting is done with this glove attached. It is almost ideal gloves such as fat and oil durability, strong alkalinity, penetration resistance, desorption, suppleness, durability, etc. Depending on the work content fluid comes in from the sleeve so personally it is saved a little longer by about 5 cm. This review is about item#06126653. It was solidly made, the size was as shown, and there was no problem with mounting on the desired LL purchase. This review is about item#06126671. When immersed in caustic soda to remove the dirt that arrived at the knife, long durable rubber gloves are indispensable. This product is perfect. It is taller than a mass merchandise store. It is hard to use with making it much thick. I bought it for replacing the Hub Gris of the truck but it is difficult to move a bit. It's too thick and my sensation does not come to my hand. A slightly longer size is GOOD! It is solid and easy to use. Previously, I used a type without a sleeve cover. It is a good product. Bamboo cage dyeing, bleaching etc. I used a variety of items, but I do not slip the most. I used gasoline and kerosene for parts cleansing of the bike, but I could use it without problems either way. It was just right for washing with moderate length. Regarding thickness, it is slightly inconvenient to grasp small parts (carburetor jet etc), but it is normal for normal parts. I am going to continue to use it because the price is reasonable. Shoa Grove is the best though I spent a lot of it! Since it is a long type, the cuffs of work clothes will not be dirty and it will be saved. I also used other manufacturer's products, but this item is stronger.